One of the cheapest accommodation options in Dubrovnik would be staying in one of hostels throughout the city. Find below our selection of hostels ideal for affordable and comfortable Dubrovnik holiday. Prices of beds in hostels start from €35 per person in high season (June & July & August) and from €15 rest of the year. Free Bird Hostel is situated in the residential area of Gruz, some 500 m from main bus station and only a short walk from ferry & cruise port. This new hostel offers accommodation in air-conditioned and clean dormitory rooms. Guests have access to shared bathrooms equipped with hair dryers and free toiletries. Only a few steps from the hostel there is a bus stop from which you can take a bus (no. 8) to the Old Town. In the near vicinity you will find pizzeria, two bakeries and a cake shop. 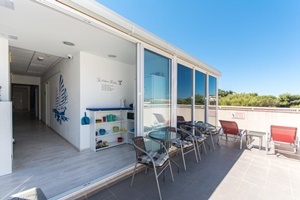 This great hostel is an ideal choice for exploring Dubrovnik. This great hostel is situated in Dubrovnik downtown, 1.5 km from Old Town. The ferry port is only 5 minutes on foot from this hostel and from there you can catch all ferries to the nearby islands as well as ferries to Korcula, Brac, Hvar and Split. Hostel 365 For U is very clean and offers accommodation in 4-bed and 6-bed dormitory rooms. There is a 24-hour reception desk as well as a shared lounge area with satellite TV. In the near vicinity of the hostel you will find many restaurants, cafés and shops. Bus stop to the Lapad beaches is just down the road from the hostel. This hostel is situated in the port area of Gruz, only a few minutes bus journey from Old Town. You can reach this hotel from main bus station in 5 minutes. In the area you will find grocery stores, bakeries and open market. 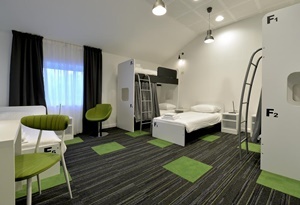 Hostel Euro Adria offers air-conditioned 4-bed and 6-bed dormitory rooms with shared bathrooms and toiletries. Each room has a flat-screen TV. There is a 24-hour front desk with friendly staff, gift shop and hairdresser at the property. Hostel Petra Marina has a great central location with many restaurants, cafés, shops, bakeries, travel agencies in the near vicinity. To reach the Old Town's sights you can take buses from the nearby bus stop or walk for about 20-30 minutes. Hostel's dormitory rooms are air-conditioned, furnished and painted in light nautical colours. They come with a balcony with a sea view. Guests can use the shared bathroom equipped with a shower. Free Wi-Fi is available in all areas. Only a few steps from this hostel you can reach embarkation point of all ferries from Dubrovnik (Elaphite Islands, Mljet, Korcula, Brac, Hvar, Split). 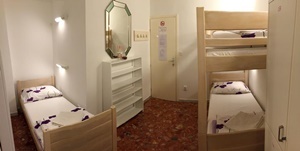 Hostel Angelina features main building (Plovani skalini 17a) and 3 annex buildings next to Stradun. Guests can choose from air-conditioned dormitory rooms (4-bed, 6-bed or 8-bed mixed) and private rooms (twin, triple and quadruple). All guests can use kitchen in the main building to prepare their meals. From the hostel you can easily reach all Dubrovnik sights as well as the most popular Dubrovnik beach - Banje beach. In the Old Town you will find numerous restaurants, ice-cream shops, outdoor cafés, galleries, museums and souvenir shops. Hostel Sol is situated in the neighbourhood of Gruz, very close to the port and main bus station. For reaching Old Town you will need to take a city bus (20 minutes bus ride). From the nearby pier you can take ferries to the islands or those sailing further to Split. Hostel Sol offers accommodation in modern air-conditioned rooms. Most rooms have their own bathroom and are equipped with a TV, safe, keycards, wardrobes and extremely comfortable beds with anti-allergen bedding. Staff of the hostel are very friendly and will help you with information about exploring Dubrovnik.